Melt the chocolate on double boiler and stir with rubber spatula until smooth. 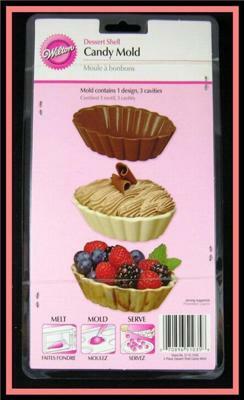 then add it into the mold (I used Wilton dessert shell molds 2115-1035). Tap the chocolate mold to let out the air bubbles and the chocolate becomes all even. Let it set in the fridge for about 5 min then put it in the freezer for 2-5 min or till it becomes foggy. Combine one pack of Dream Whip + 2 spoons of cold milk + vanilla. Whip the cream until soft and fluffy, then refrigerate. 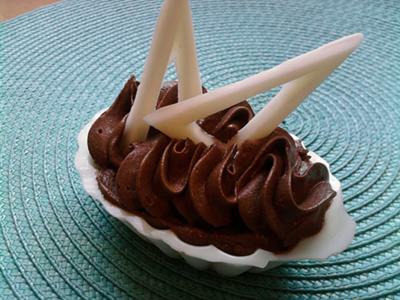 Once you are ready to unmold and fill the chocolate dessert cups, divide the cream into 2 or 3 bowls (depending on how many flavors/colors you want) and start adding your flavors. For the pistachio, I added green coloring to give it a rich color look. For the chocolate I just added the coco powder. 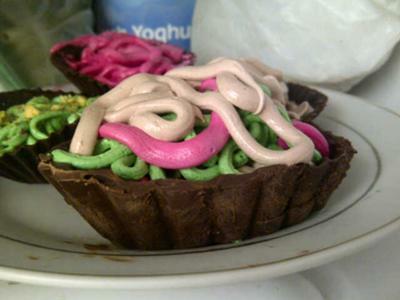 Pipe your cream and start squeezing in a messy way to get the look (see picture) and decorate it the way you like. Note: I uploaded a picture of how I wanted them to look and the colored one so you will see how it turned out. The taste was nice and smooth, but my chocolate shell was melting so fast. I'm not sure what was my mistake but every time I try, I do it with a new way till I get it right! I think you've done a beautiful job, even though your colourful chocolate shells are not as perfect as you had hoped, they certainly do look cute and yummy. There seems to be no real reason for your chocolate shells to melt unduly unless the temperature in the room is quite warm. Chocolate melts when you touch it, of course, because of your body temperature, but it should be fine just setting at room temperature. I do hope you'll continue to experiment and show off your creations as you do them. We love going on your candy making journey with you. Chocolate chips are not a good choice to use to melt down for molds, they are intended for cookies and cakes. Might I suggest you get chocolate candy melts and melt them down over warm but not boiling water, they are sensitive to extreme heat. Your product looks quite nice. Hope this advice helps. Contact me if you need more help. candymaker1975@yahoo.com.